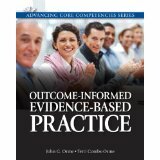 This chapter reviews the content of the book, integrating example cases from all the chapters. We begin by reviewing and answering some possible objections to systematic measurement of client outcomes. In the next section we review the importance of consistent systematic monitoring of client outcomes and discuss some of the ways you can use the data from monitoring to help your clients achieve their goals. Finally, we discuss the critical issue of how and when to use the information you obtain from measuring and monitor to modify an intervention when your client is not achieving his or her goals. Chapter 3: Why Measure, Monitor, and Modify?